LYON, France (AP) — Manchester City twice came from behind to draw 2-2 at Lyon and secure a place in the knockout stage of the Champions League with a game to spare on Tuesday. 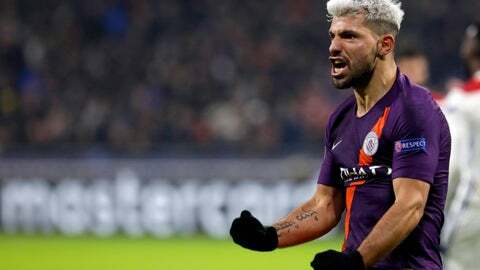 Sergio Aguero earned the point the English champions needed to guarantee a top-two finish in Group F, heading in a corner from Riyad Mahrez in the 83rd minute — just after Maxwel Cornet regained the lead for Lyon with his second goal of an end-to-end game. Having joined Memphis Depay in virtually missing an open goal in the first half, Cornet gave Lyon the lead in the 55th with a dipping shot into the corner from just outside the area. Aymeric Laporte equalized in the 62nd minute, also with a header from a set piece like Aguero. City leads the group on 10 points, three clear of second-place Lyon. The French side travels to Shakhtar Donetsk, which is two points further back in third, in two weeks with both teams still in with a chance of qualifying. A draw for City against Hoffenheim, meanwhile, would see Pep Guardiola’s team finish in first place and set up a last-16 match against a second-place team. That looks to be beneficial, with heavyweight sides like Real Madrid, Juventus and Bayern Munich currently topping their groups. “We were so strong in that situation,” he said. Lyon inflicted City’s only loss so far this season by beating the Premier League leaders 2-1 in the opening round of group matches, and caused them as many problems in the return match. City looked especially open in central midfield, where Guardiola deployed Raheem Sterling — usually a winger — because of injuries to Kevin De Bruyne, Ilkay Gundogan and Bernardo Silva. It was a tactical switch that didn’t really work. Lyon flooded forward adventurously, with Depay miskicking from inside the six-yard box with the goal at his mercy. It was the Netherlands forward who then sent over a low cross that left Cornet with what appeared a simple finish into a gaping net. Instead, the striker decided to take a touch and by the time he got his shot off, the sprawling Laporte made the block. Cornet struck the bar with a flying volley off Depay’s cross near the end of the first half, which City did well to finish on level terms. Lyon switched off at set pieces soon after both of Cornet’s goals, meaning that the home side only led in the game for a total of nine minutes. Laporte reacted sharply to divert the ball into the net after David Silva flicked on Mahrez’s inswinging free kick. It was another delivery from Mahrez that led to the second equalizer, Aguero getting in front of his marker at the near post to glance a header into the bottom corner. “Lyon are technically good and quick and strong,” City defender Kyle Walker said. “That’s why they hurt us at the Etihad and that’s why we had point to prove.